Anyhow, I don't want to hold you up. So let's get down to business. Remember the tile beer coaster tutorial from last week? 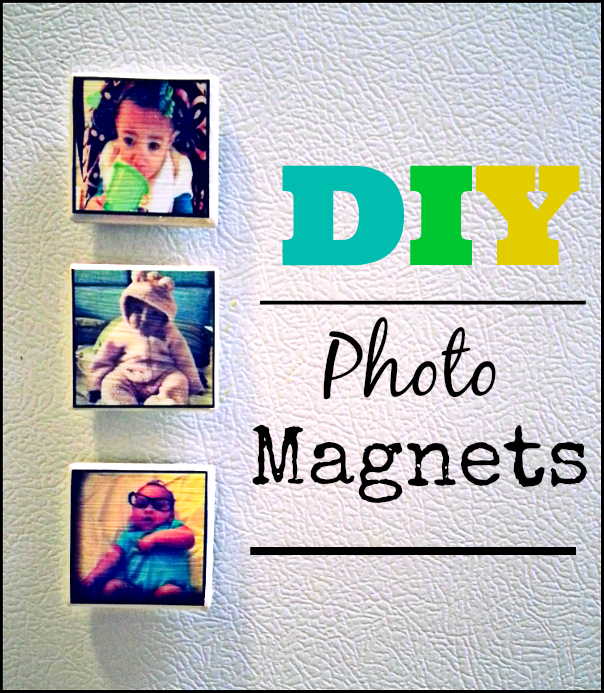 Well, meet that projects lesser known cousin, the tile photo magnets. Once you've purchased the supplies for the photo coasters, the only thing you'll need for this project are magnets and small tiles. You can purchase a pack of 50 at any of your local craft stores for under $5--even cheaper if you print your 40% off coupons. First, cut your photos to match the size of your tiles. Next, apply a coat of Mod Podge to the tile and place your photo on top of the glue. Make sure the photo is not crooked. Once the glue dries, you won't be able to move it. Next, apply a coat of HARD COAT Mod Podge to the top of the photo and tile. Be sure to cover the whole tile, not just the photo. You'll want the entire top part of the magnet to be waterproof, so apply liberally. Let the Mod Podge dry for 30 minutes to an hour. Apply another coat. Allow this to dry overnight. (note: I know some of the other tutorials say 30 minutes will do, but in my experience, the Mod Podge will need ample time to cure. If you don't allow these to dry properly, you'll end up with coasters that stick to everything. Not cool). The next day, apply a few coats of acrylic spray, allowing time in between to allow it to dry. Finally, glue magnets to the back of the tile. Let this dry for 30 minutes to an hour. Now step back and admire your lovely work. The best thing about this project is you can basically make as many as you want. I ended up with about 20. I'm planning on gifting them in sets of four. That's five presents for less than $5.00. Not bad. Not bad at all. So that's all folks. I hope you enjoyed this series. With all the holiday gift guides floating around the internet, it can get easy to get consumed in buying the most expensive and trendiest gifts. Without even realizing it, we're missing out on the thing that matters the most, the thought that goes into the gift. Anyone can go to the store and purchase the latest iPad. It takes time and thought to create something for someone that they will treasure for the years to come. But those are the most special gifts of all. The gifts that come from the heart. It is my warmest wish that you and your loved ones have a wonderfully happy and merry Christmas. Those look brilliant! What a great idea to give them to people in sets of four, a really special present! These are so cute! So happy to have stumbled upon your site! Looking forward to following along. Great idea! Pinning this for next year. :) TFS!